Ocean Series, full canvas covers, generator, with sound shield, heat/ac, Raymarine 4KW Radar C-80 display/GPS Fuel Flow Vacu Flush Head New Stratoglass w/covers Cockpit cover and full camper canvas Generator/w soundshield 2004 FOUR WINNS 328 Vista, Location: Portsmouth VA US - This lightly used cruiser is loaded with all of the options that make it a nice weekend getaway or extended cruising vessel. Key options include Kohler Generator, Heating/Air Conditioning, Cockpit and Galley Refrigerators, Generous accommodations depict big boat size inside and out. Double berths in fore and aft cabins, a large U-shaped settee Full galley features corrian countertops, refrigerator, electric stove, coffeemaker, microwave with generous storage throughout. 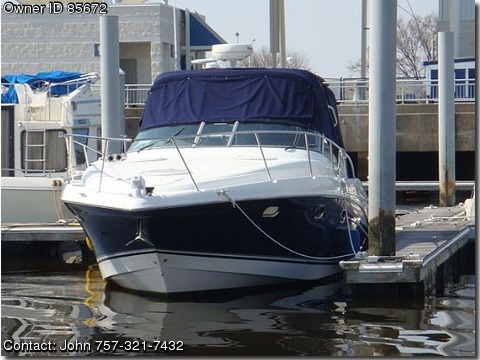 Shorepower w/Battery Charging System, TV/DVD Player, VacuFlush Ceramic Toilet, Anchor Windlass, Radar Arch, Camper Canvas, Cockpit Cover, Clarion AM/FM/CD Stereo w/Sirius Satellite, cockpit wet bar with refrigerator, among others. There is a full cruising instrument package including a state-of-the-art Raymarine RL80C color radar/chart plotter, Ray 215 DSC VHF, digital depth sounder, navman fuel flow indicator. Power is provided by twin 320-hp Volvo Penta engines with SS Duo-prop I/O drives New stratoglass windows for enclosures, covers for all stratoglass, transferable service plan with two years remaining; covers most big ticket items. Dealer maintained since purchased new in 2005. Contact now, as owner is motivated to sell.